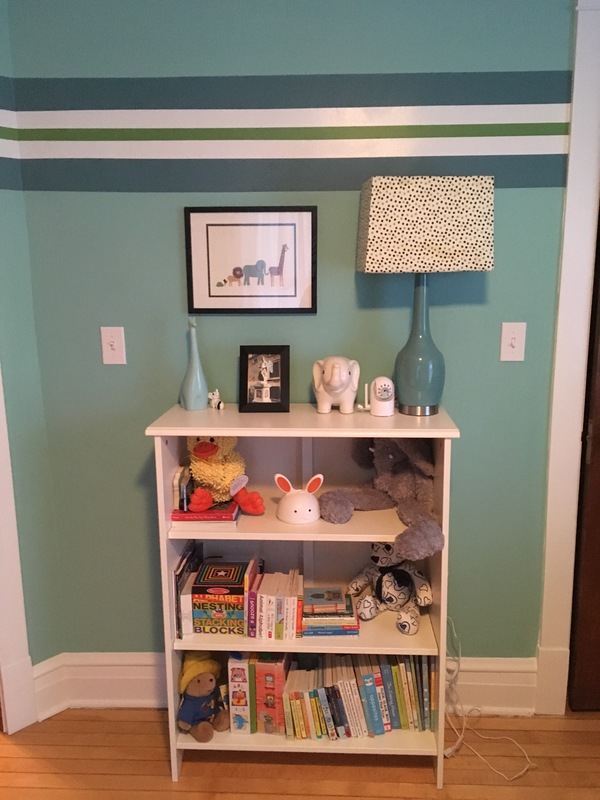 This room is small but perfectly sized for a nursery, which really doesn’t need much more than a crib, rocker, dresser and bookcase. 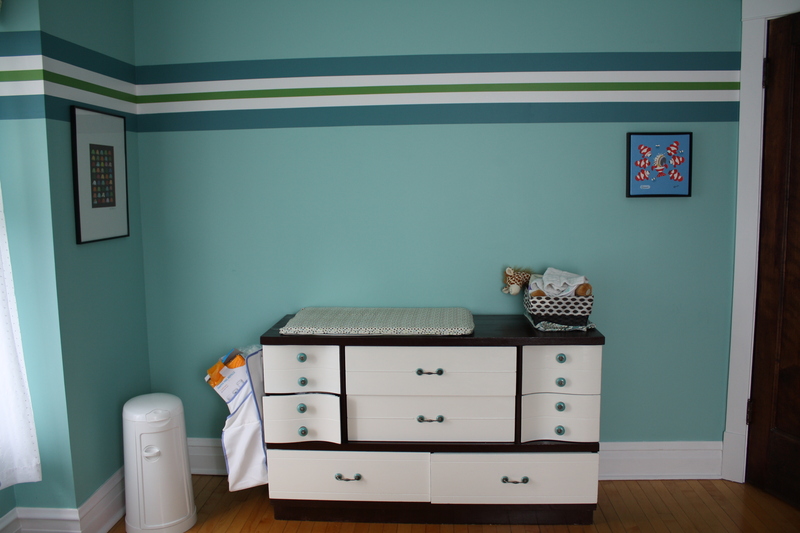 I started with fabrics from Joann’s—one striped, one polka dot—in coordinating colors. 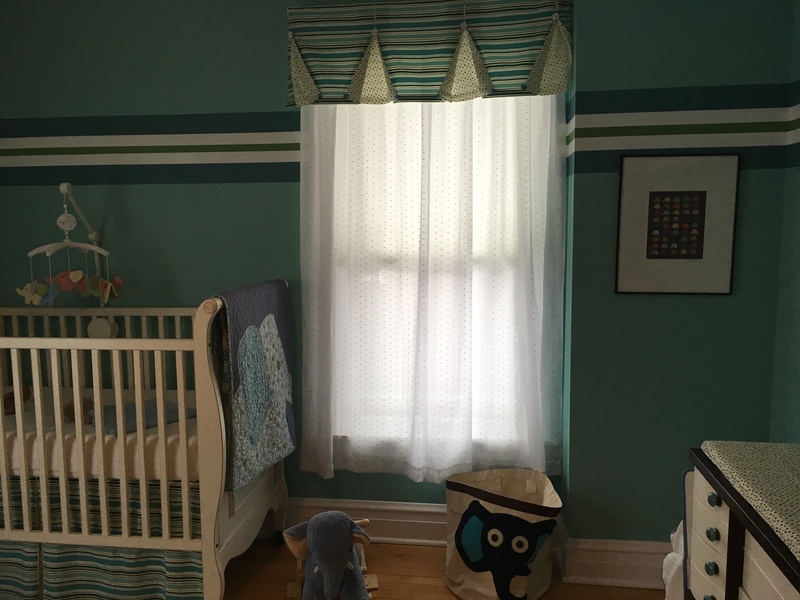 My sewing wizard mom created the bed skirt, crib bumpers, valance and two changing pad covers. (If you are lucky enough to have seamstress skills or can impose on someone who does, this is a very budget-friendly solution.) 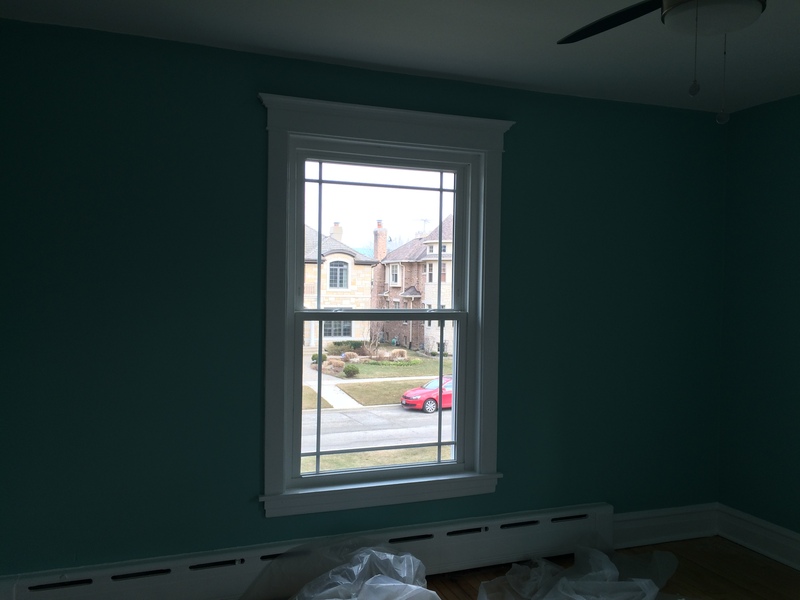 Then we added blinds for room darkening purposes, and then covered them with Swiss dot curtains. 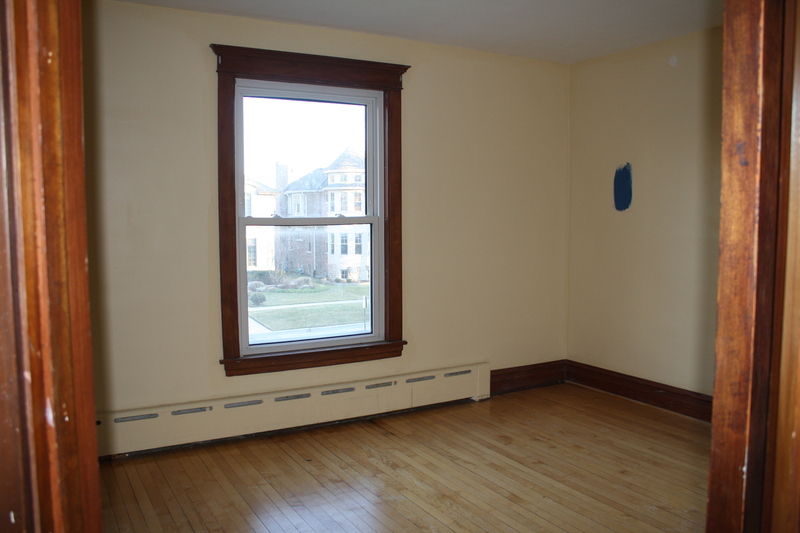 The art pictured to the left of the window is the embroidered alphabet that my mom made to hang in my nursery. Vintage. The rocker, literally called the Best chair, lives up to its name. It is the most comfortable piece of furniture that we own, and we bought it in colors that match our living room furniture so we can move it downstairs when our kids age out of rocking. Elephants are the unifying theme, as you can probably tell. 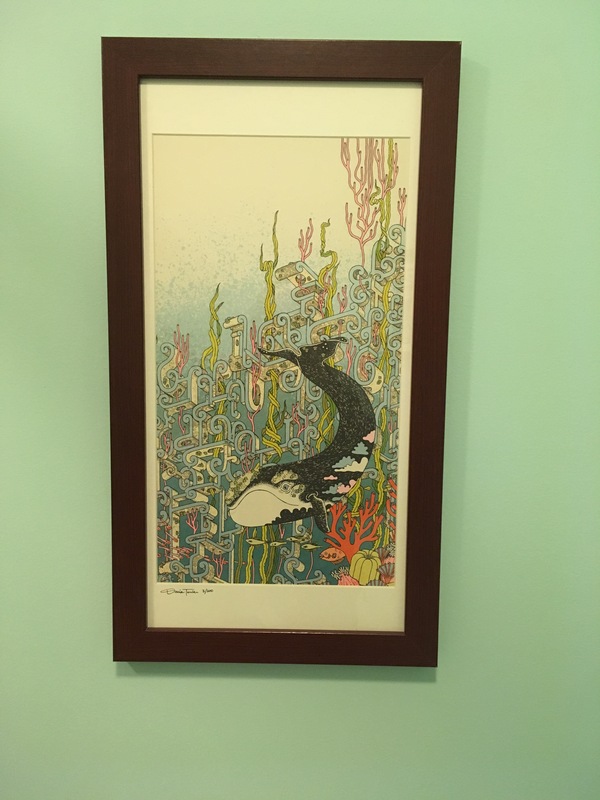 It drives me crazy that the art is wonky in the photo above, but oh well. Proves I dusted at some point. 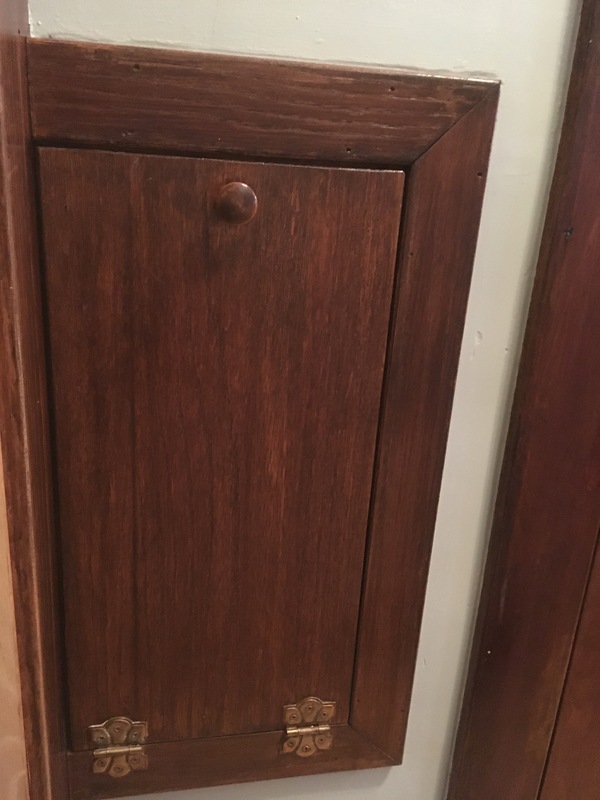 This dresser was my grandma’s, but it needed an update. My mom painted it and added Anthropologie knobs to match the decor. 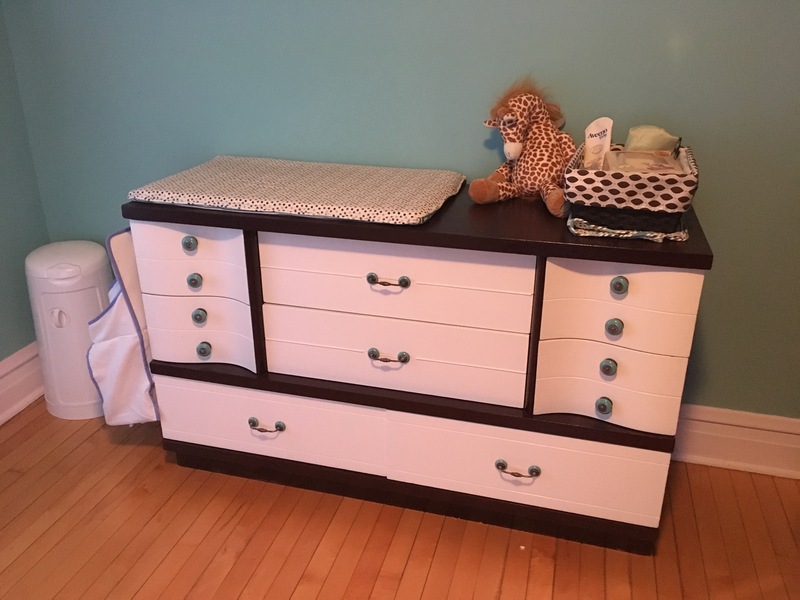 It’s perfect as a platform for a changing pad and the small drawers are ideal for separating tiny baby clothes. 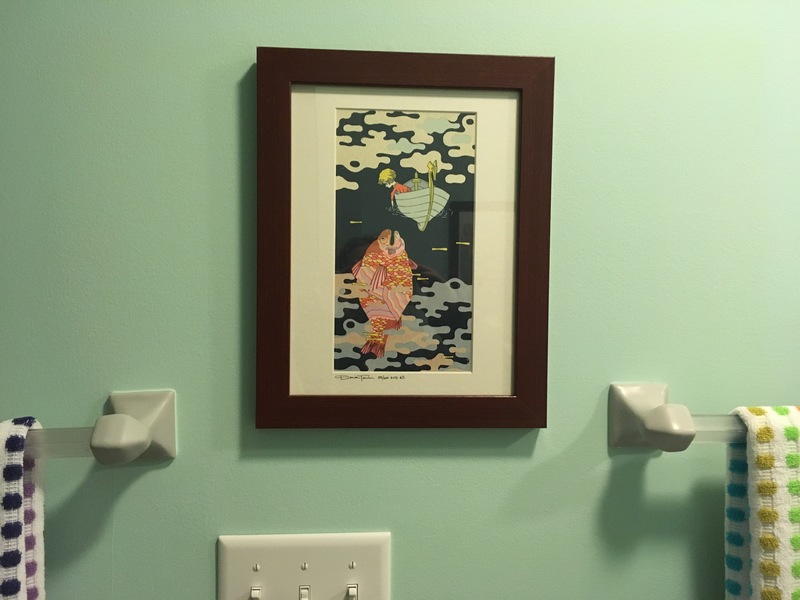 You’ll notice the lack of artwork above the changing pad because we learned the hard way that our kids will kick and smack at it while being changed until it falls off the wall. So blank it will stay. The bookcase, with custom lampshade by my mom. 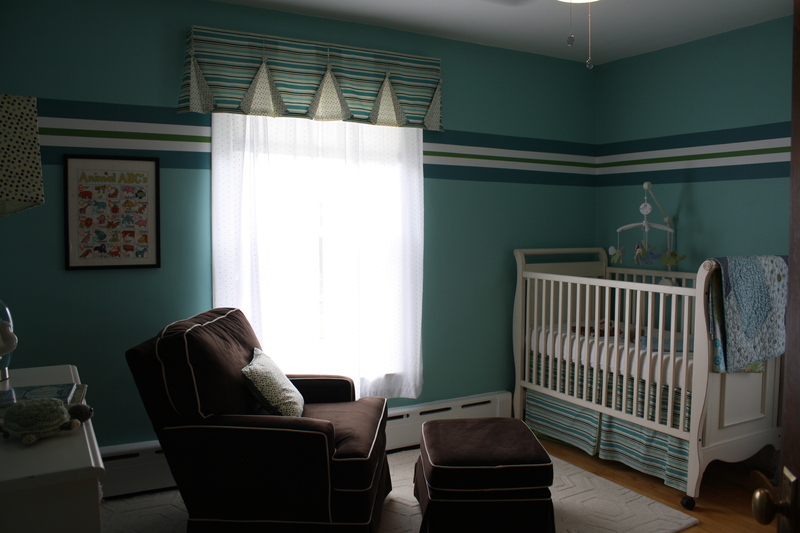 The design for this room came from the nursery decor we had in our old house, with a few updates. It was inspired by a fabric that we found at Joann’s when I was still pregnant with my first, and I liked it so much I wanted to continue it here. 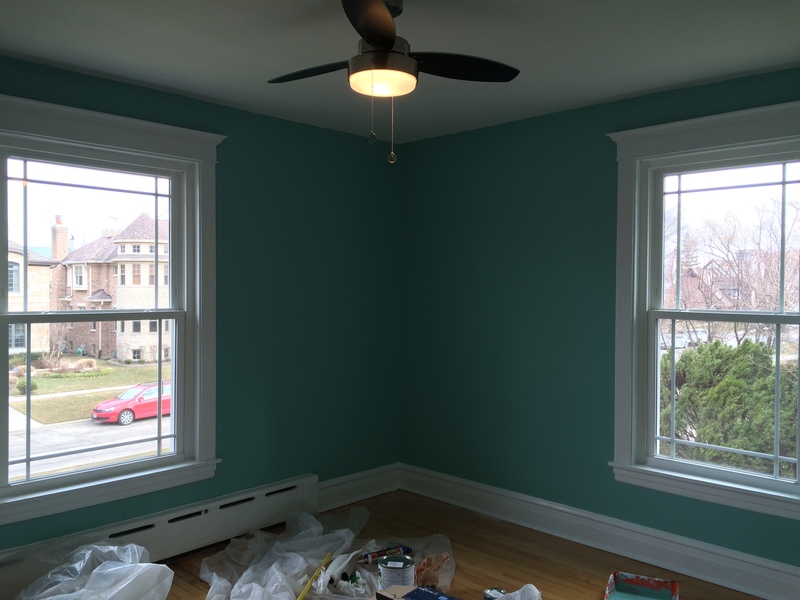 First, we painted the walls this jewel tone greenish-blue. 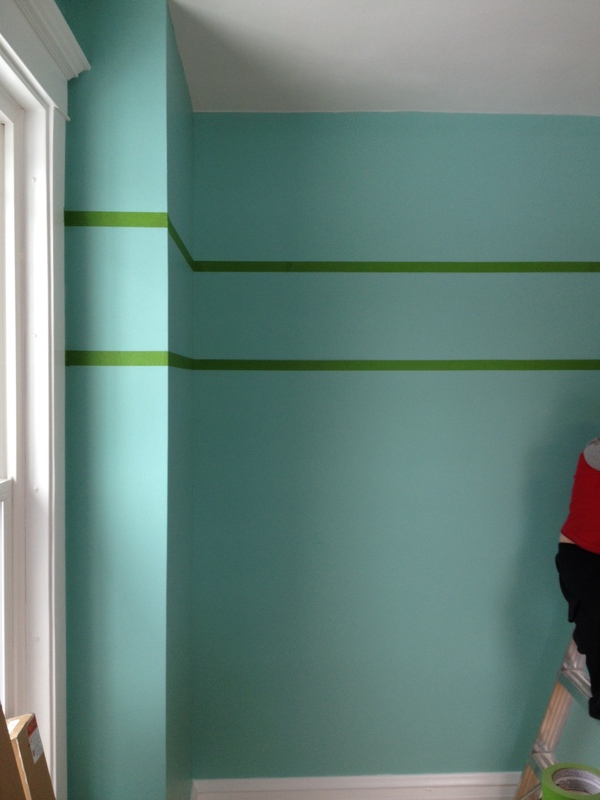 Then it was time for the stripe. 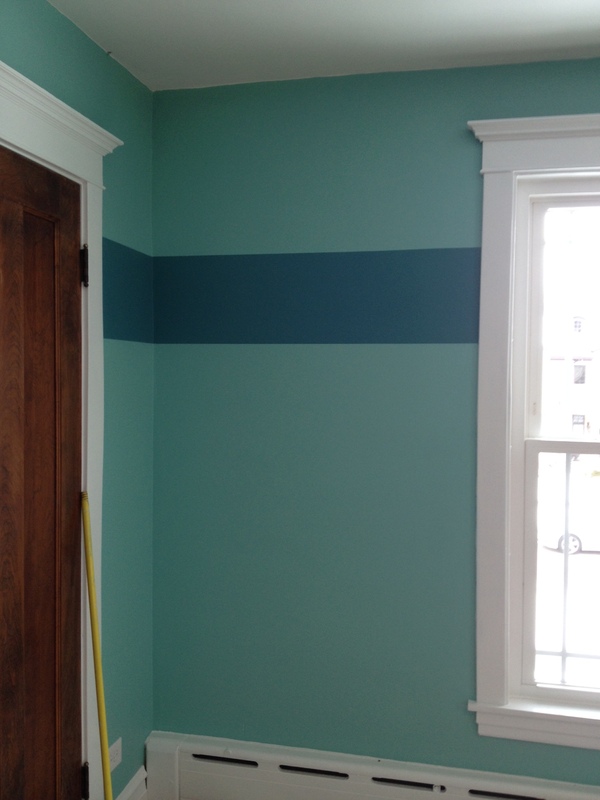 The next step was filling in the strip with this teal color, which is where we stopped in the old house. 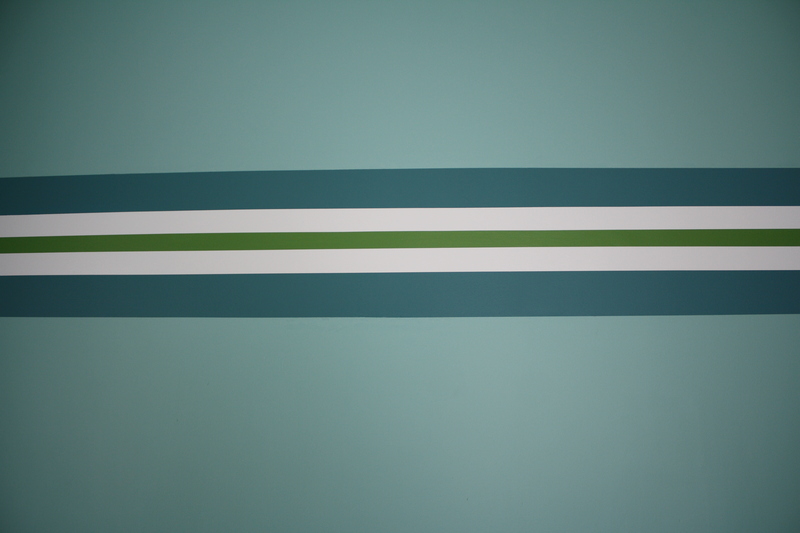 This time, I had the idea to add yet more stripes inside the stripes. What followed was a taping nightmare that I forgot to photograph, probably because my mom and I were too busy grumbling swear words to be bothered by such trifles. 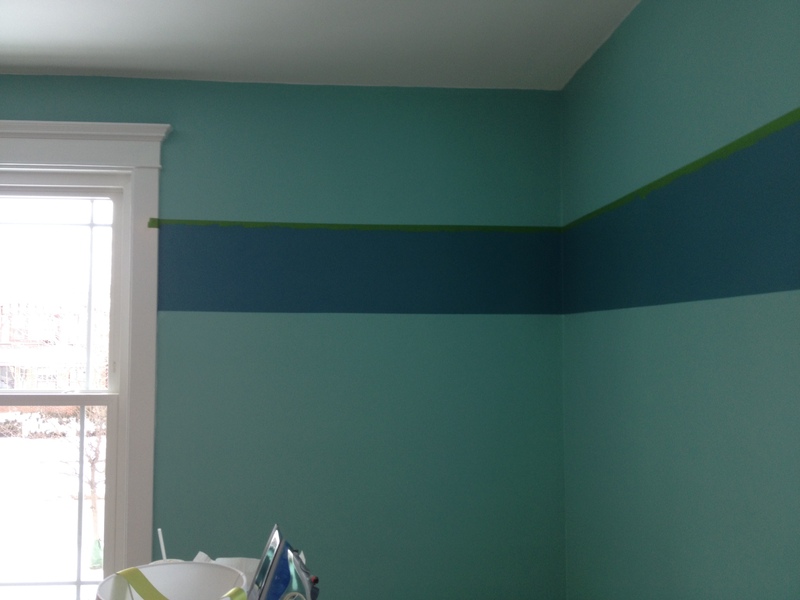 After the teal wide stripe was painted, we waited a week before proceeding so that the tape wouldn’t pull up the fresh paint. Then we taped off the area for the white stripe, filled that in, and waited another week. 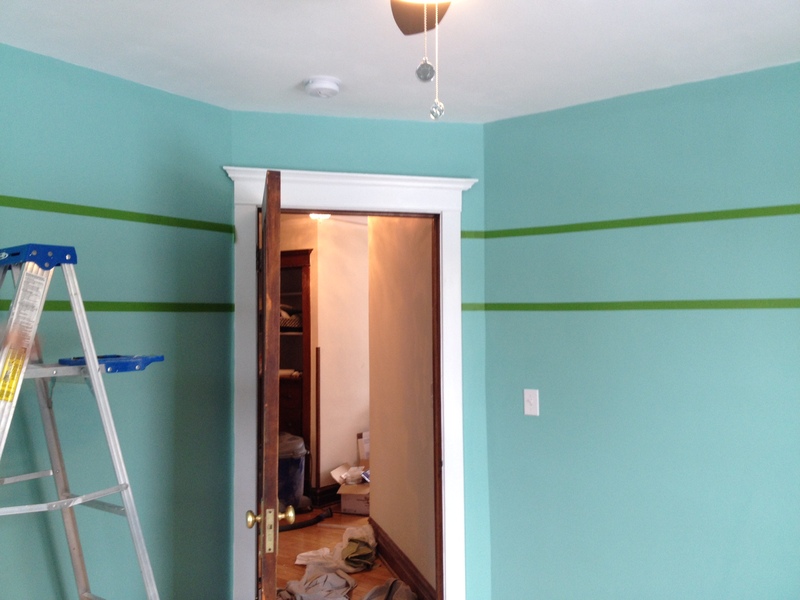 Finally, we taped off the area for the grass green stripe (a width we mostly eyeballed) and called it a day. It was a huge pain, it took about three weeks, and concluded with my mom telling me, “No more stripes. Ever again.” I hope the baby enjoys them, because they are here to stay. Here’s how it turned out. I love it. 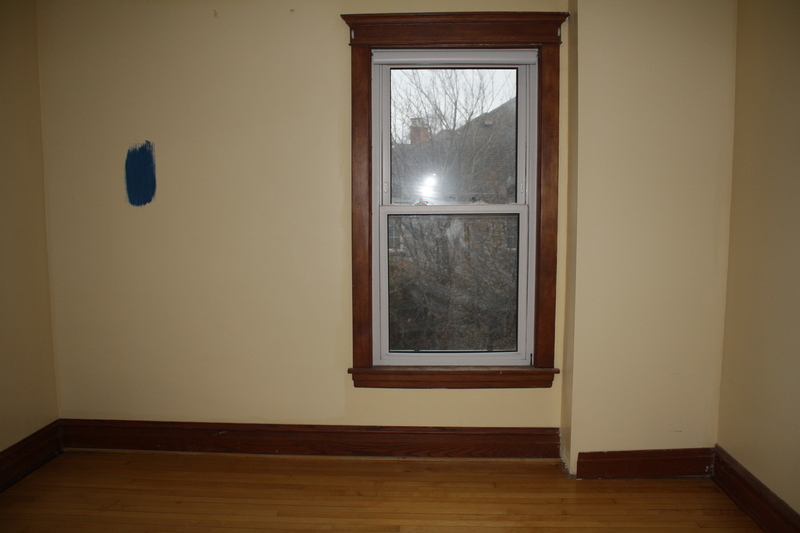 This room didn’t have much that needed re-doing — it was mostly a decorating job, but we did have to replace the windows. There was a full-on breeze coming through them, and when my husband went to open one, he was almost guillotined. 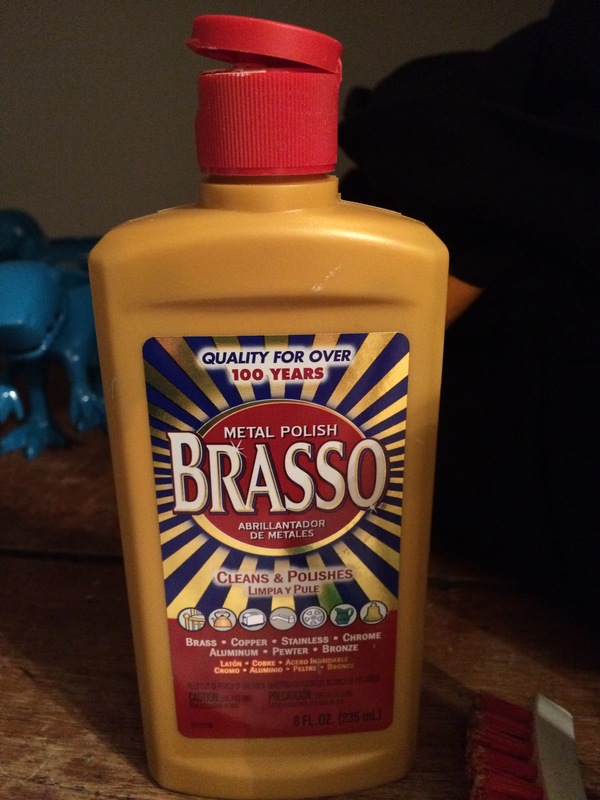 So…those had to go. 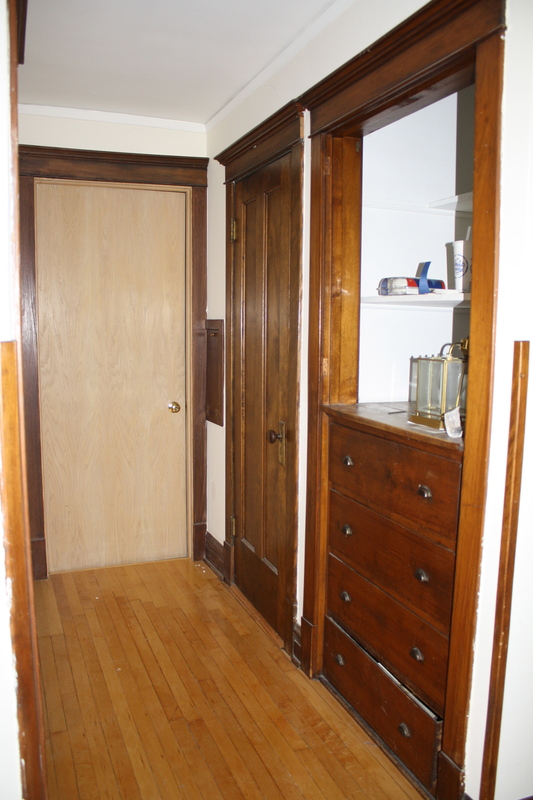 The doors were in very good shape, so we wanted to keep those the natural wood, as we did in the other bedrooms. 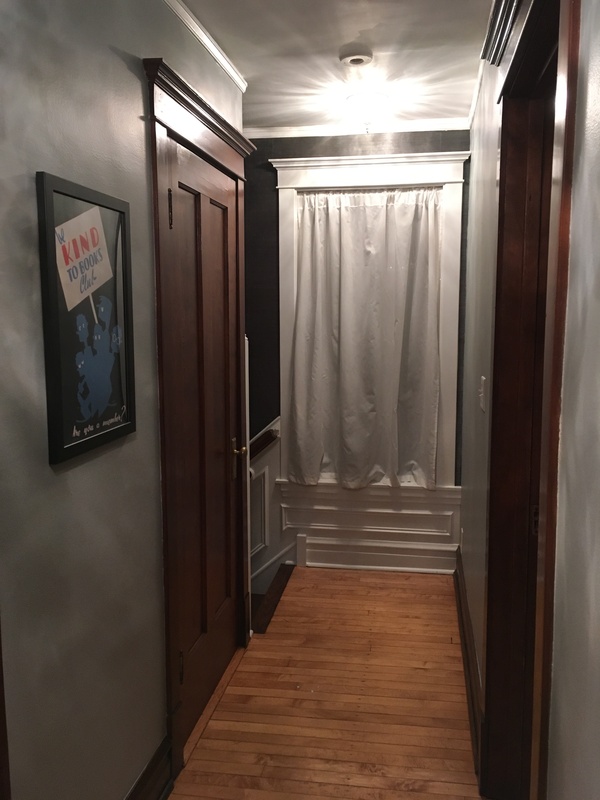 The baseboards were not so lucky – they had odd cuts from old remodels and the stain color was not consistent, so my husband repaired those before painting them white. 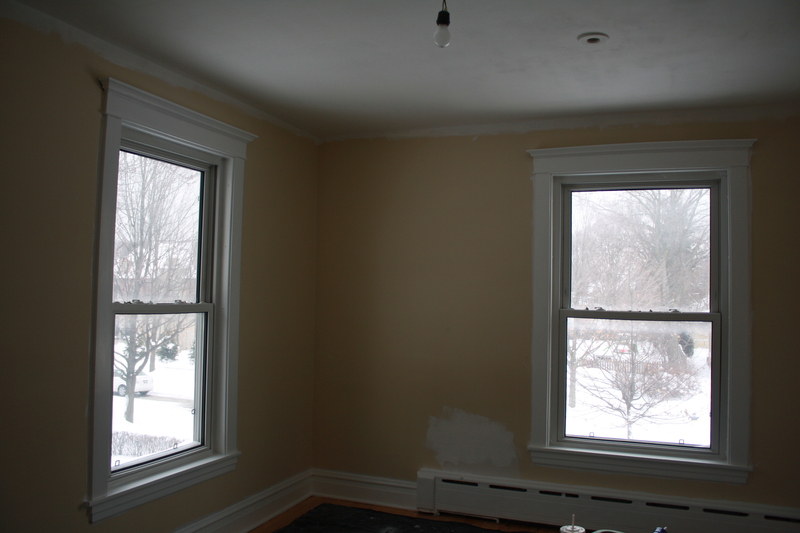 Here’s a view of the room after the trim was painted a fresh white, with the walls still puke yellow. 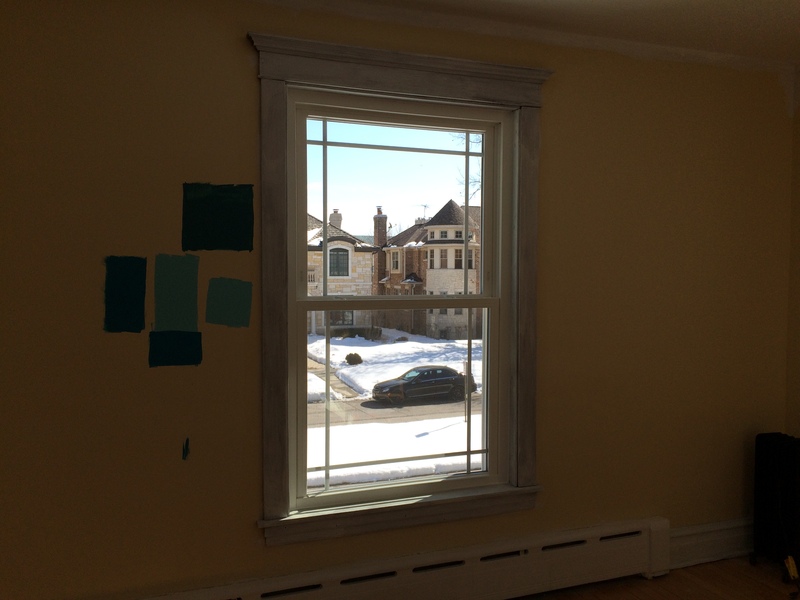 Here’s a view of the new windows with a Prairie-style grid that look great from the inside and outside and also stopped the Arctic chill that had been this room’s previous hallmark. 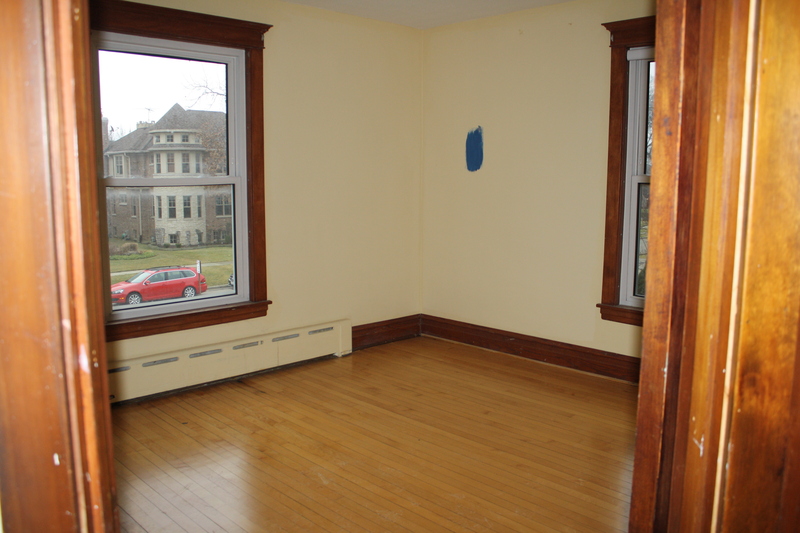 This bedroom was slated to be our nursery. Here are the before pics, when it was a plain old box. This will be an all-in-one post, because the update is only partial. 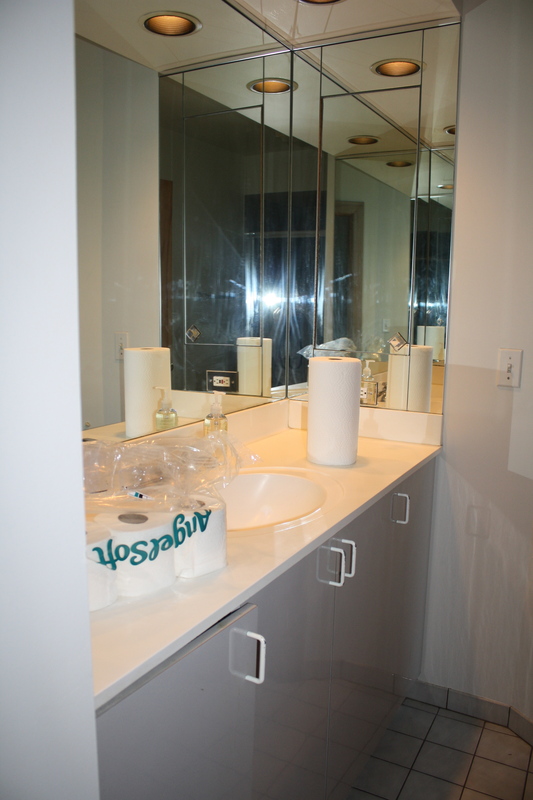 We have a hall bath upstairs that had out-of-date styling, but fixtures in good condition. 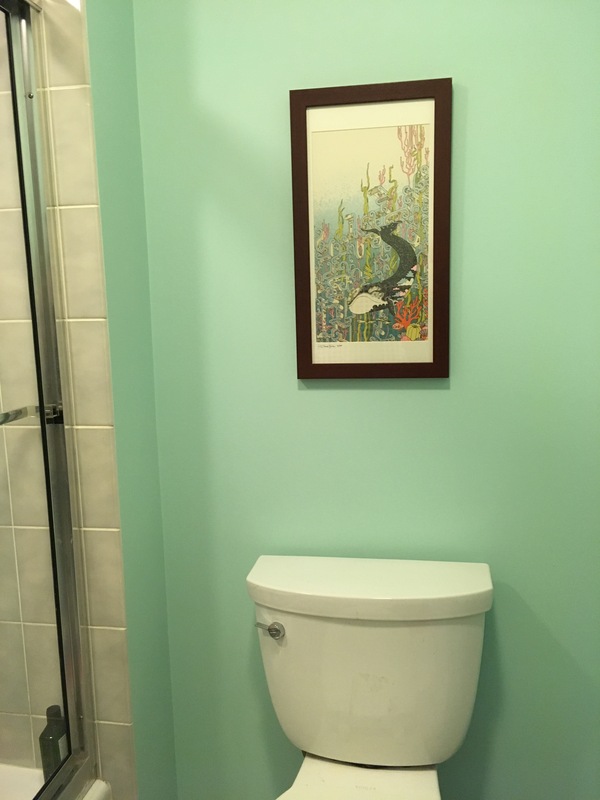 The bath is for our preschooler (and guests), so it seemed like a waste to rip it up and spend money on a complete makeover just so that a small boy could have a more Architectural Digest-worthy bathroom. He only learned to use the potty just last year, so that seemed like a disproportionate reward. 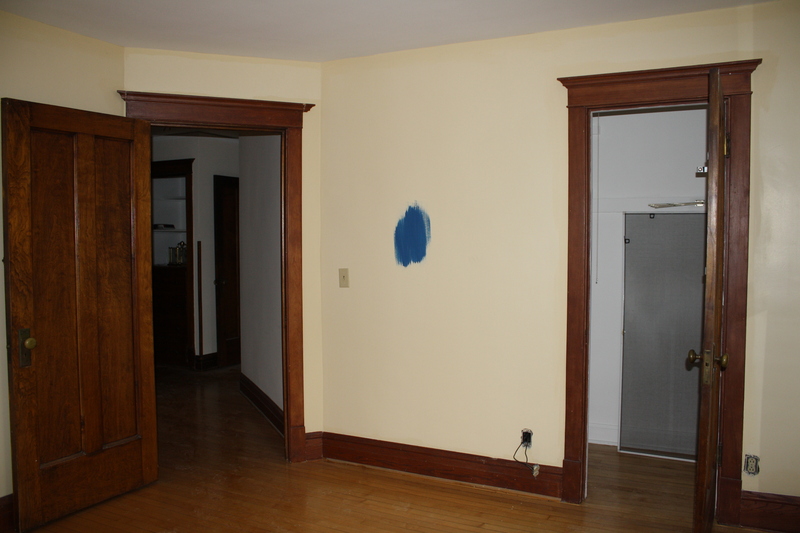 We ultimately decided just to paint and re-decorate the bathroom to buy us some time before we go for a full renovation. 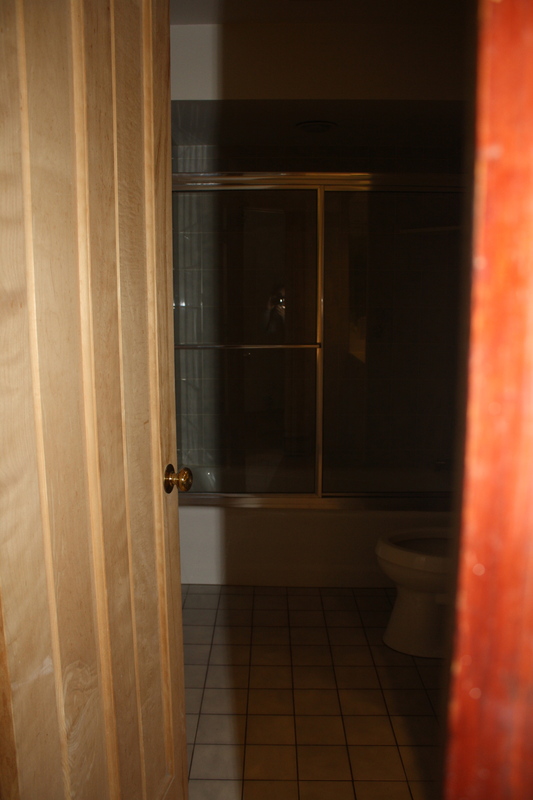 I apparently took terrible before photos, but it’s not that different so it doesn’t matter much. 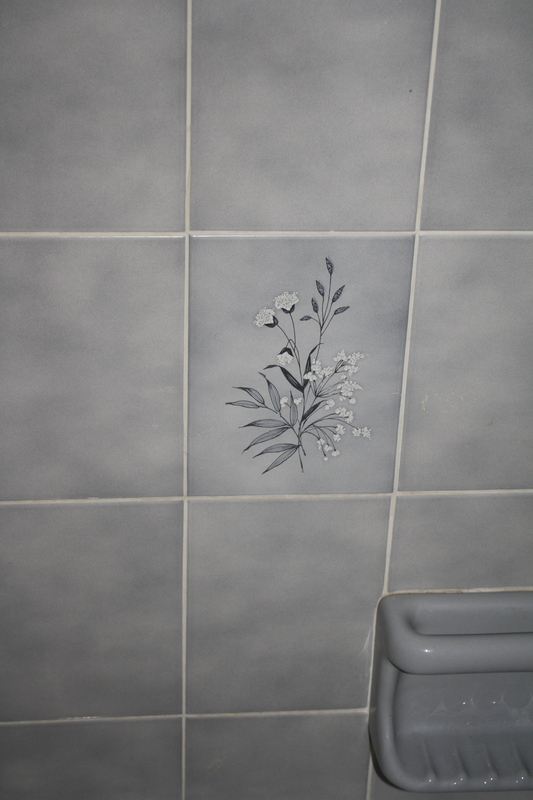 So, sure, the tile is gray with floral touches. But it’s perfectly functional. 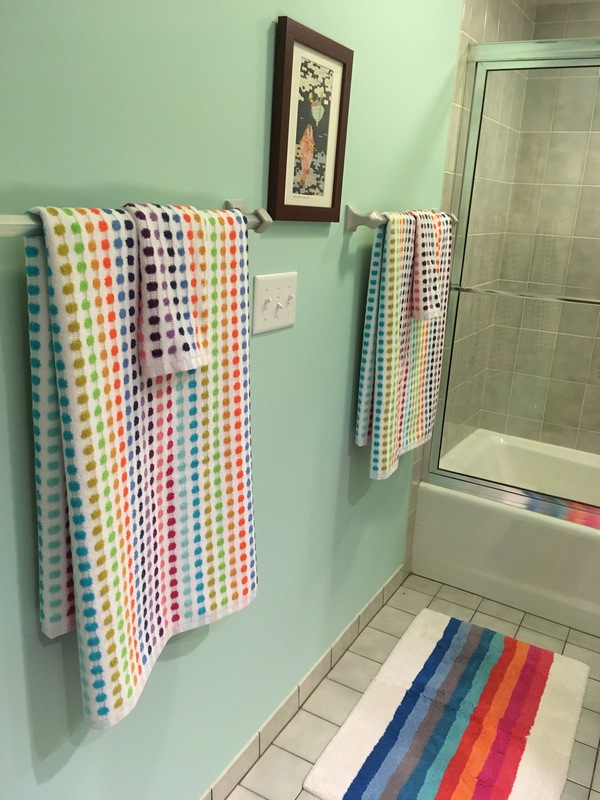 We asked our son what theme he wanted for his new bathroom, and he said, “rainbows.” They are both his “favorite color and shape”, incidentally. Easy enough. I didn’t have a lot of other inspiration for how to decorate, but then found two prints to use as a jumping off point. 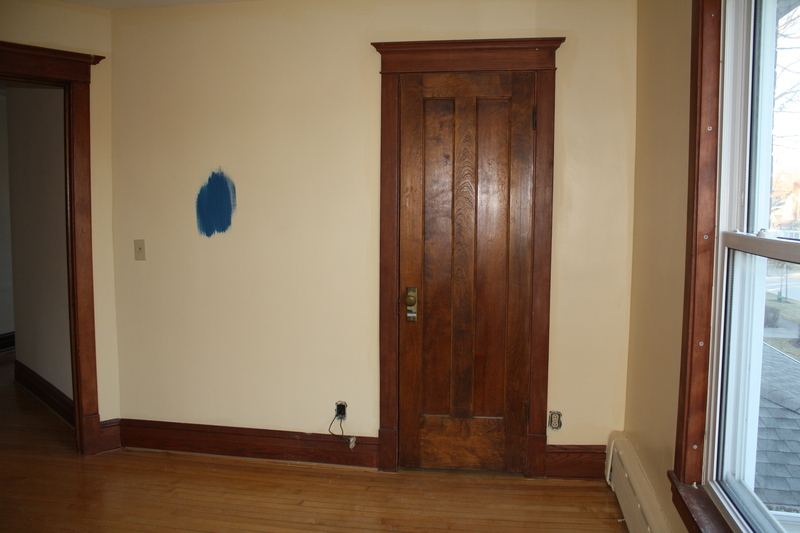 As you can see in the before photos, the door is not original and had never been painted or stained, so we had to do that as well. Then we swapped out some hardware on the left and just had to buy a few accessories. The final flourish is below. 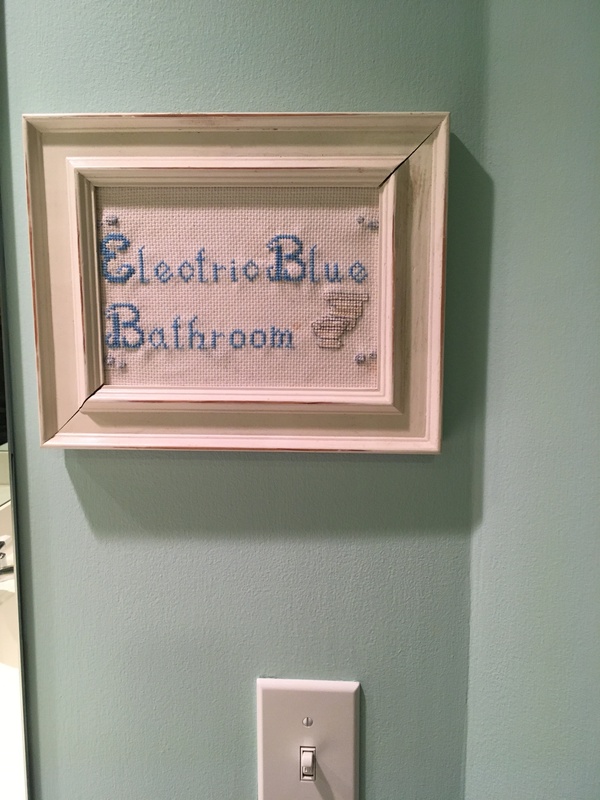 My sister needle-pointed this Electric Blue Bathroom piece for me when we still lived in the city and had an apartment with shockingly blue, floor-to-ceiling tile. Two homes later, I still keep finding a place for it. If you needlepoint me a toilet, I am going to cherish it forever. That’s just the kind of guy I am. 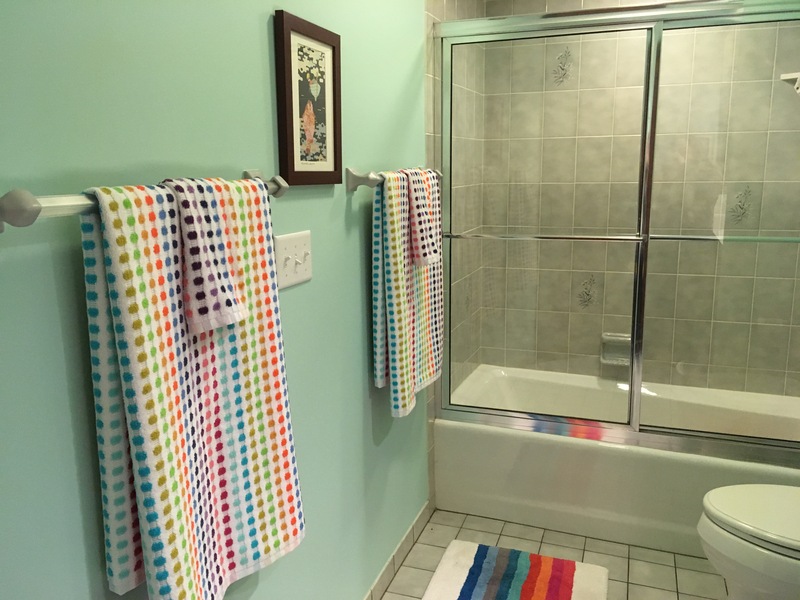 Our son loves this bathroom (“it’s very, very rainbow”) and we are pleased with the stopgap result. Andy said that he thinks it looks a little more kiddie than he was expecting, but again, the kid is 4. When he turns 12, we can masc it up with a gun rack and deer mounts. 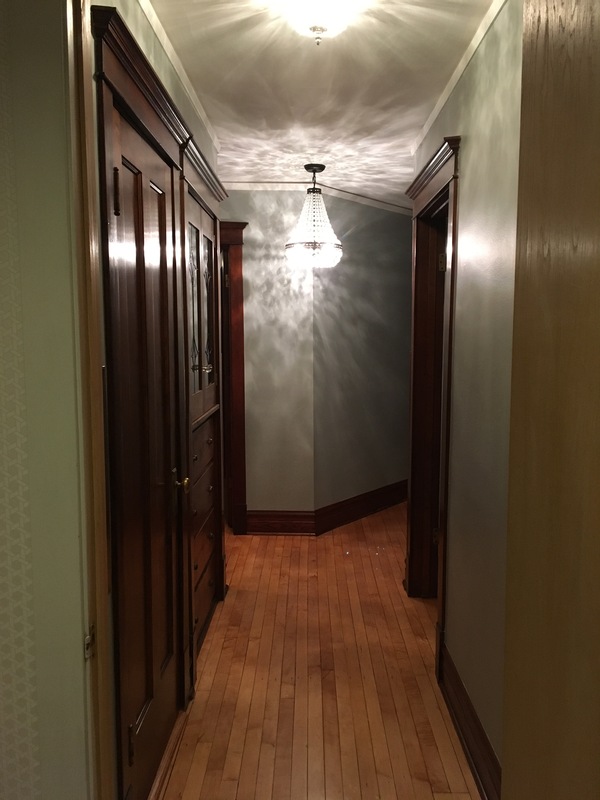 The last thing we had to do was to choose a paint color that flowed with the grass cloth that we used along the stairway and downstairs hall. Below is a photo of the three samples. Our oldest son said the one on the right “looked the most like diarrhea” — so that was a definitive no. 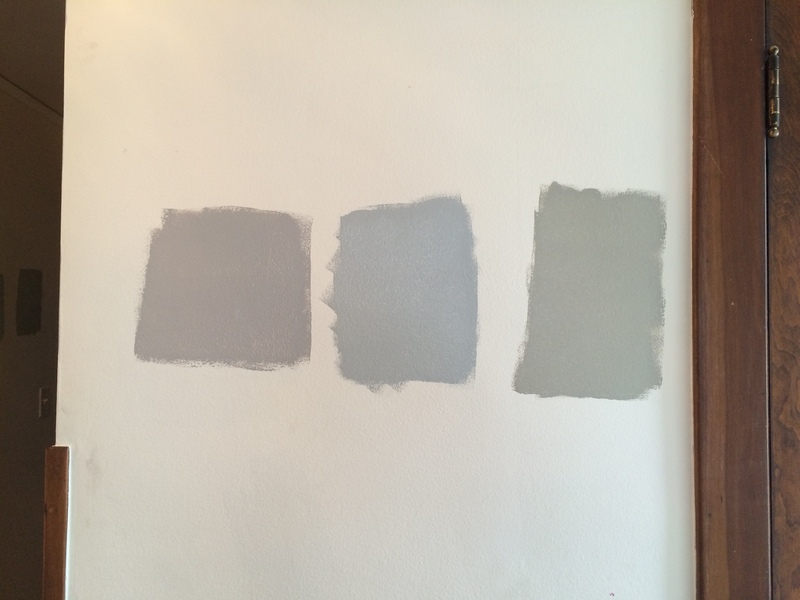 We chose the blue in the middle, which I think it’s fair to say looks the least like diarrhea. So there. So here are all the pieces put together. 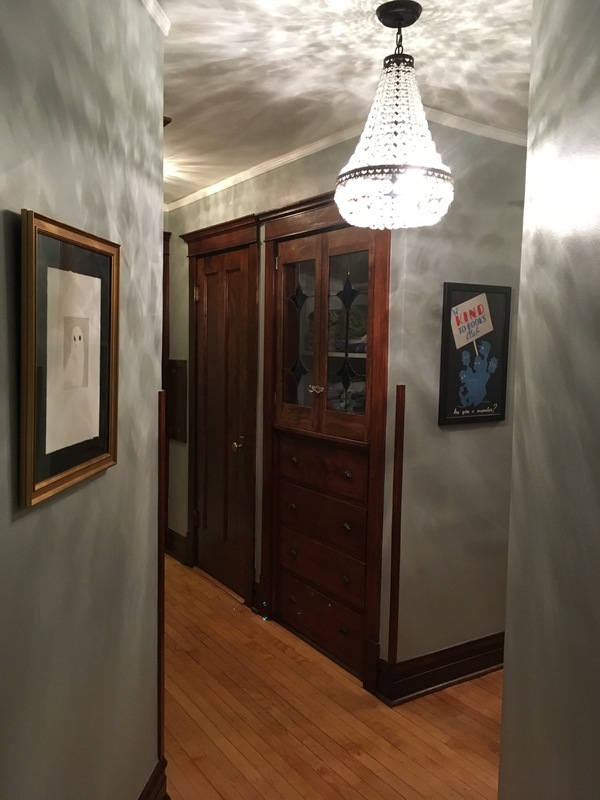 The upstairs hall had one light fixture that was oversized, brassy, and definitely not original to the house. 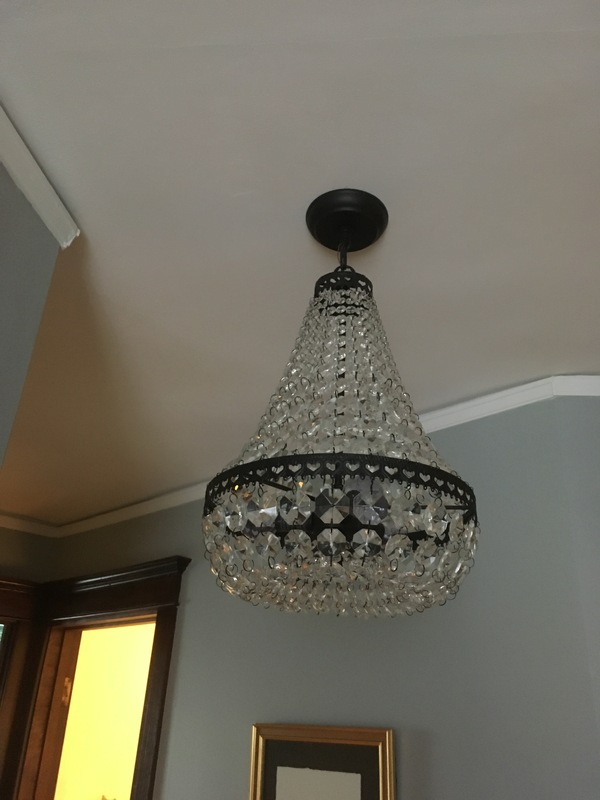 So we had an electrician add two more hall lights and now we have three fixtures — two smaller flush mounts, and one chandelier in the center of the hall. 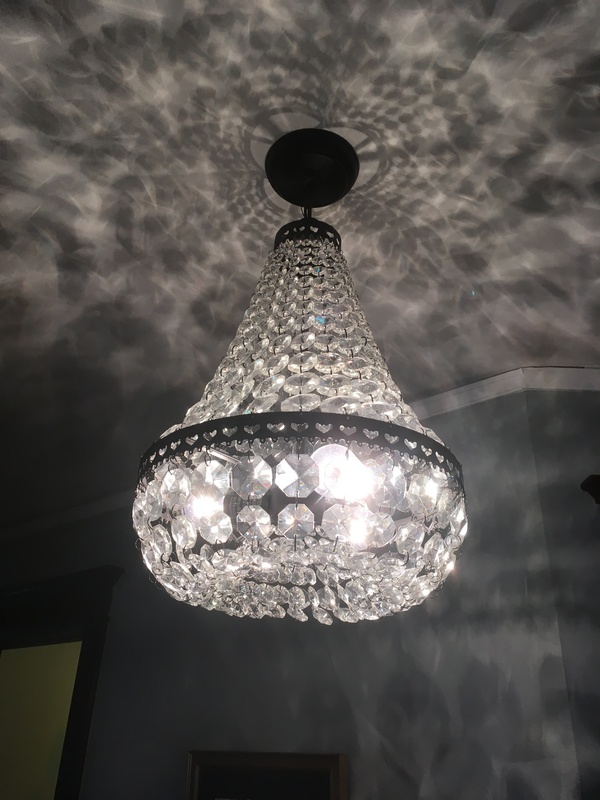 I decided to go with crystalline lights because they were the closest to the original chandeliers downstairs. 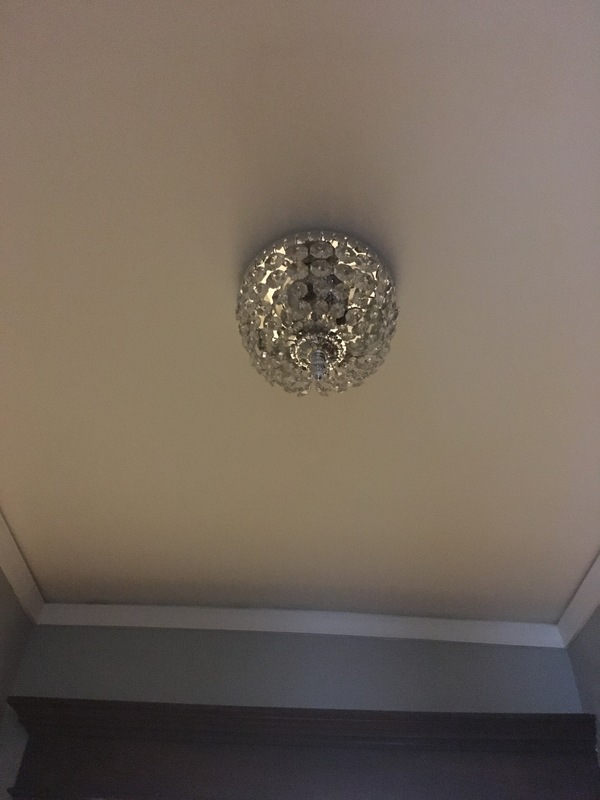 They look great when illuminated but sometimes I worry that they’re too small when they lights are off. I may at some point add a medallion, but I don’t feel motivated to do anything about it right now. It’s fine. 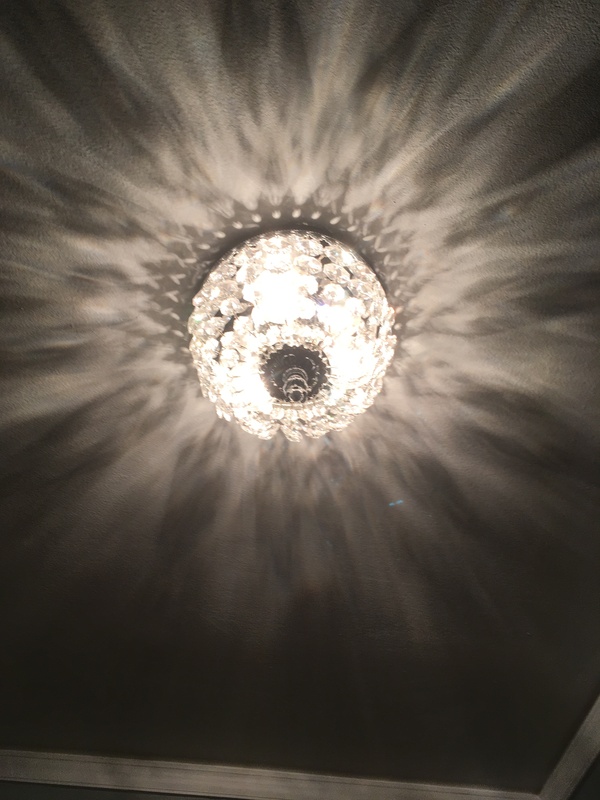 One of the easiest changes was simply brightening up the hardware throughout the upstairs. 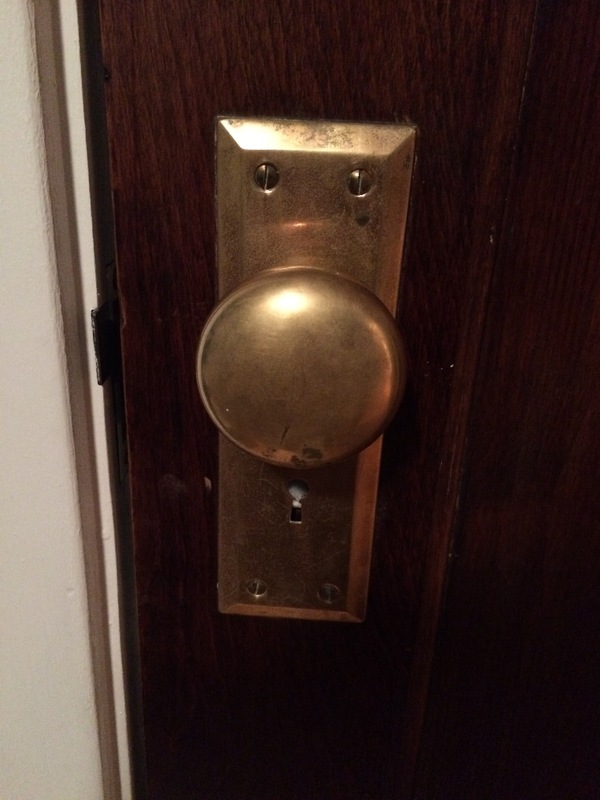 The brass knobs and pulls were original and quite tarnished. 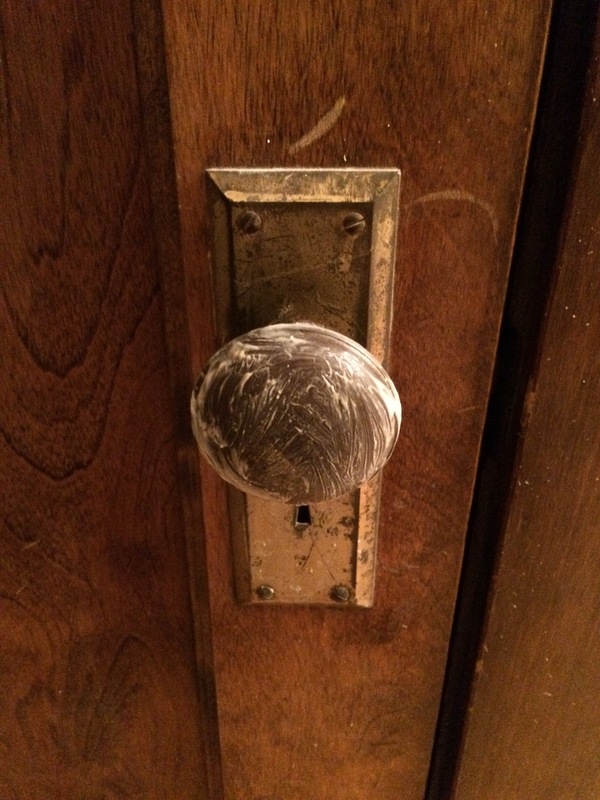 And here’s the final result of the knob in my son’s room. Even though they aren’t perfect, they have character and are much brighter than before. 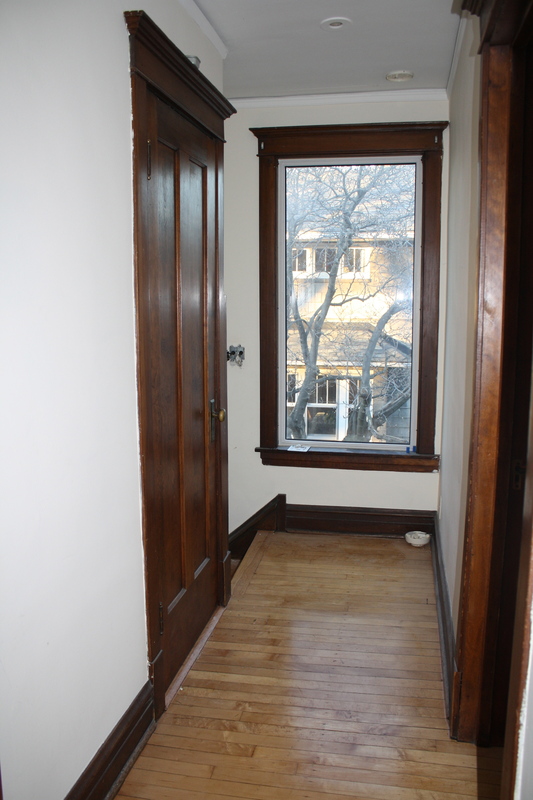 One of my favorite features is the hall laundry chute. I love it, and so do the kids. It’s the one chore I can actually get them to do without argument. Sure, stuffed animals, toy trains, and the occasional dinosaur take rides to the basement alongside the clothes, but whatever. The only problem was that the chute had lost its hinge, so every time it was opened, the knob slammed into the wall. 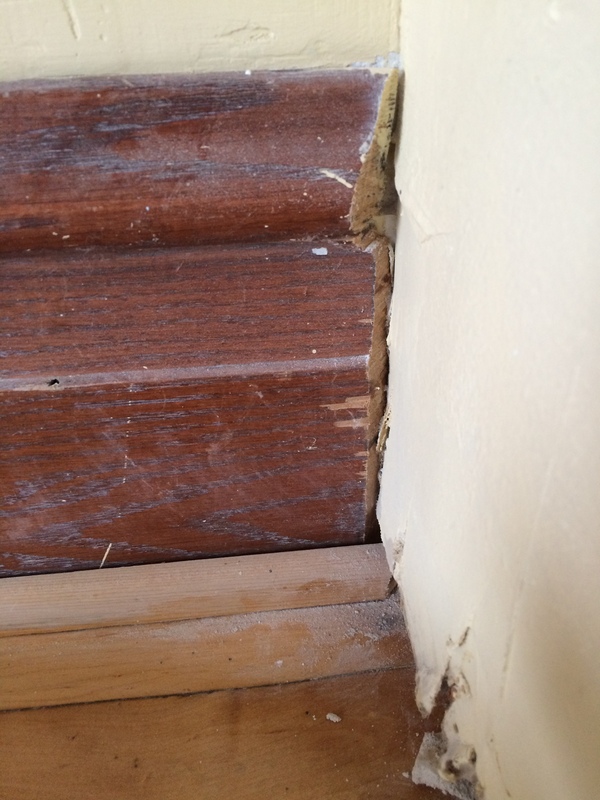 It had formed a permanent hole. 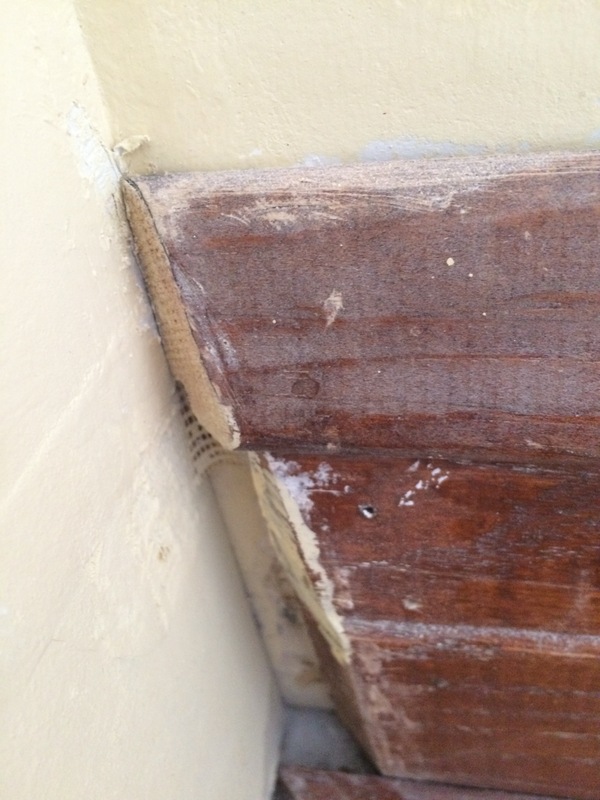 Andy added a piano hinge, patched the hole, and now it’s good as new. 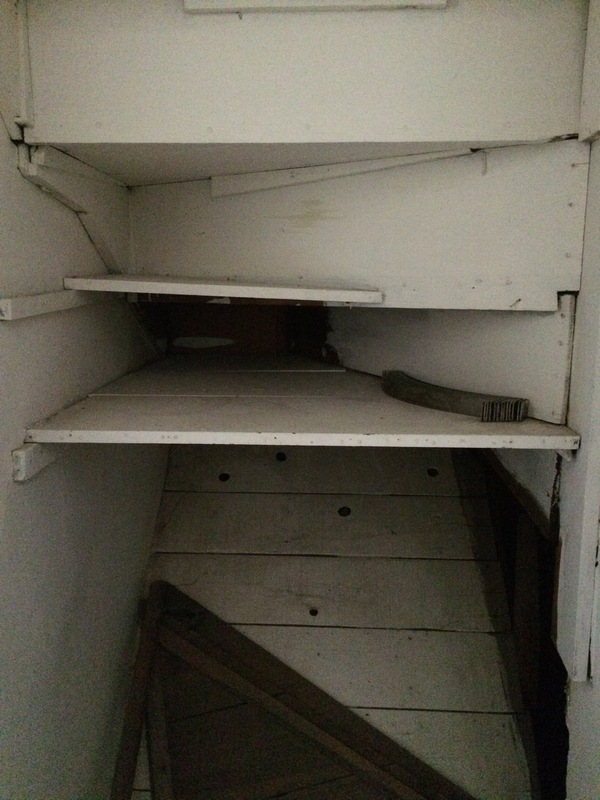 The upstairs hall closet backs up to our attic stairs, which made the closet mostly unusable. Gross, right? 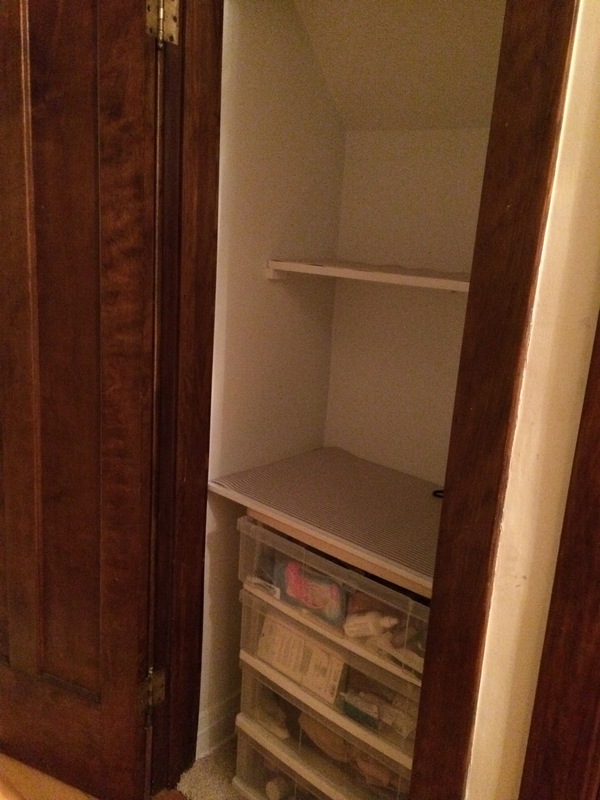 We just had it drywalled and added a shelf and now it’s a functional closet. I didn’t expect this photo to give such an intimate view of lady razors and Afrin, but now you know our shameful secrets — we have leg hair and stuffy noses. 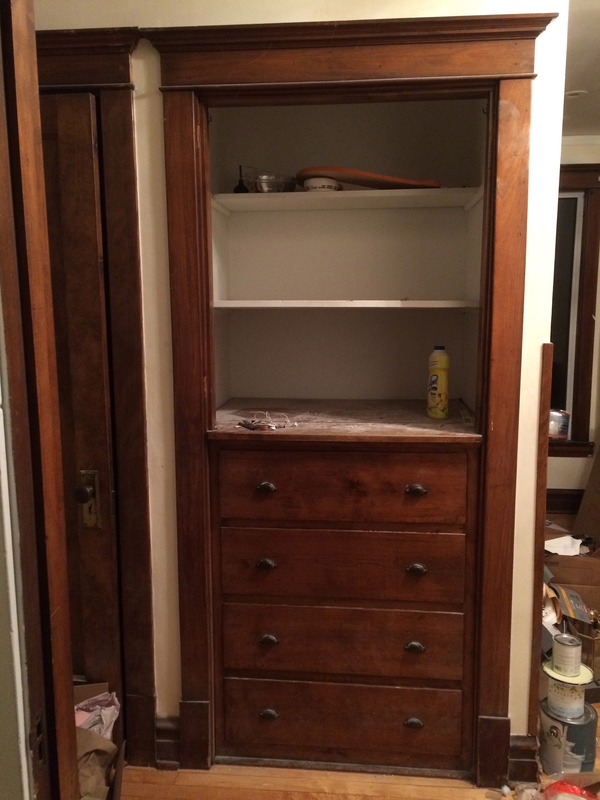 Step one was a good cleaning, followed by lining the drawers. 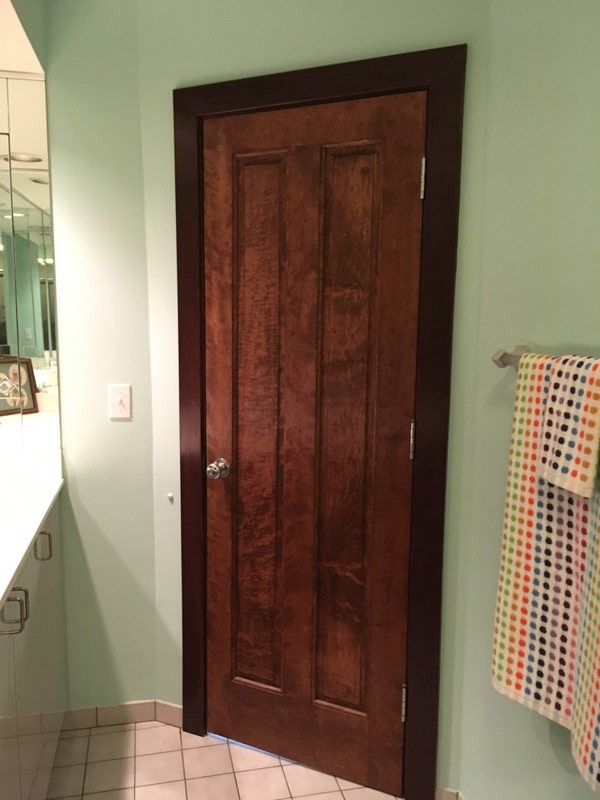 Step two was hiring a carpenter to build properly-fitting doors. 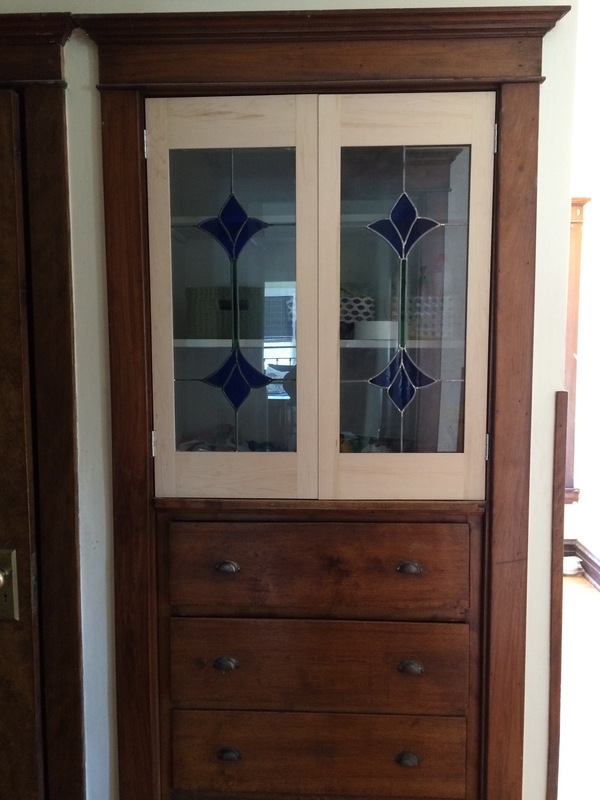 My mom makes stained glass and had created panes years ago for the kitchen cabinets of my childhood home. 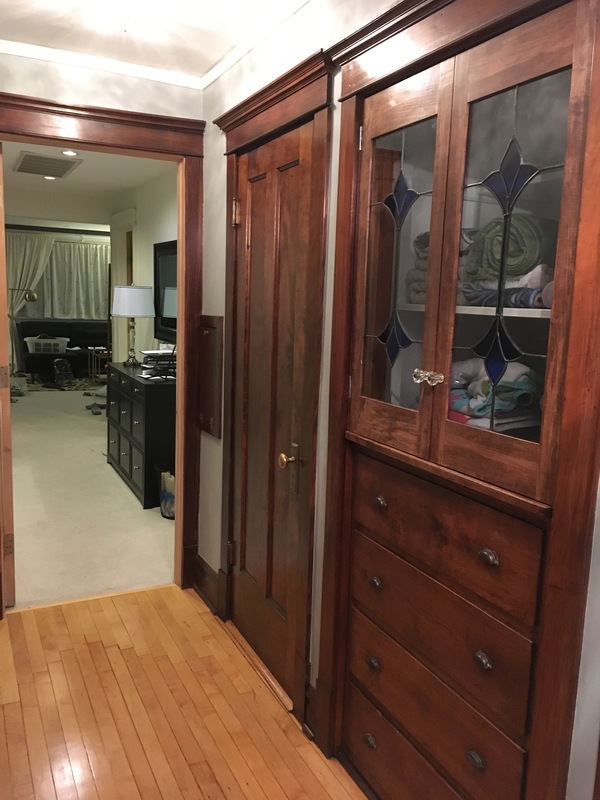 My parents removed them before putting their house on the market, so I decided to incorporate them here both for the sake of my own personal nostalgia and because a glass door was a better look than a solid door. Stained glass in general, and this design in particular, also fit with the era and style of our house. 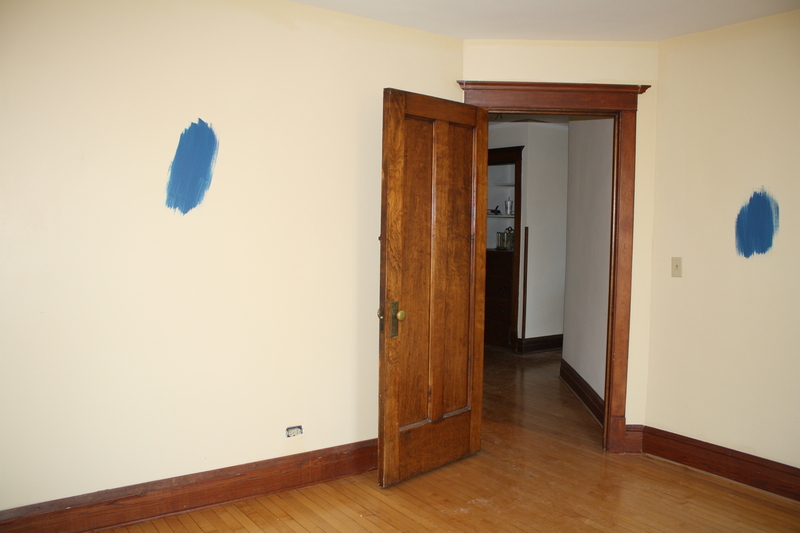 The next issue was trying to match the stain, which took my husband a frustrating weekend of experimentation. He did sample after sample after sample and finally found the right one with a reddish tint. It isn’t exact, but it’s close enough that it works. Here’s the final look, with glass pulls and a painted hall.